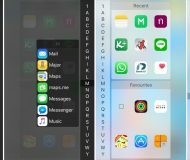 Has that longstanding bug in iOS, OS X or a first-party Apple app been driving you crazy? And did you ever wonder what’s taking the company so long to squash some of its well reported software bugs? But if you’re pissed off by buggy Apple software, why not take the time to submit a bug report to them so that they’re aware of it? 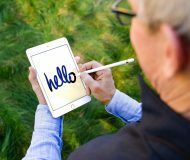 You see, it is in Apple’s interest to improve its products and give customers the best possible experiences. Letting the company know about a software problem you’ve been plagued with is always helpful and if enough people report the same bug, the issue will hopefully be escalated to someone who’s in charge. 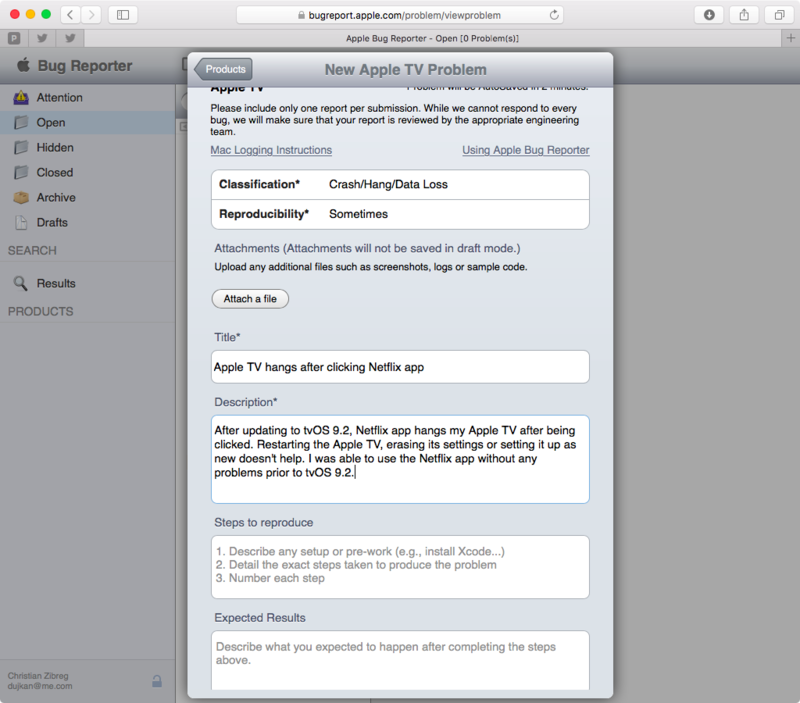 As you may have suspected, this tutorial invites you to do your duty and file a bug report or submit feedback using Apple’s many bug-reporting tools and services. Later in this tutorial, we’re going to talk in greater detail about creating system information snapshots and getting your crash logs and diagnostic reports. 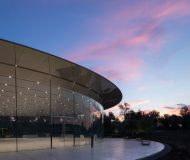 Apple Support—Apple’s one-stop shop for all customer questions, issues and inquiries, including bugs, with links to phone, chat and email support. 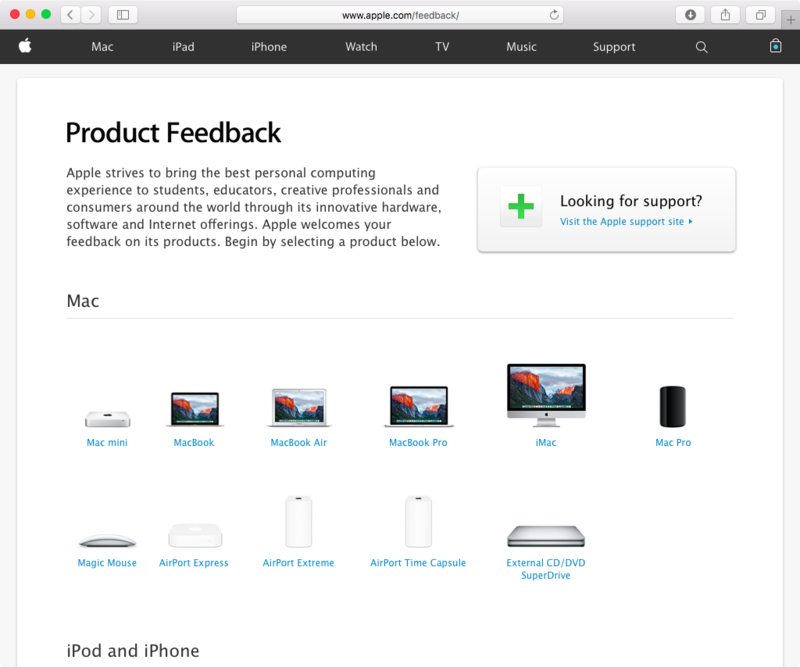 Apple Feedback—Send feature requests, bug reports and other comments for any of Apple’s products supported by this online feedback submission form. 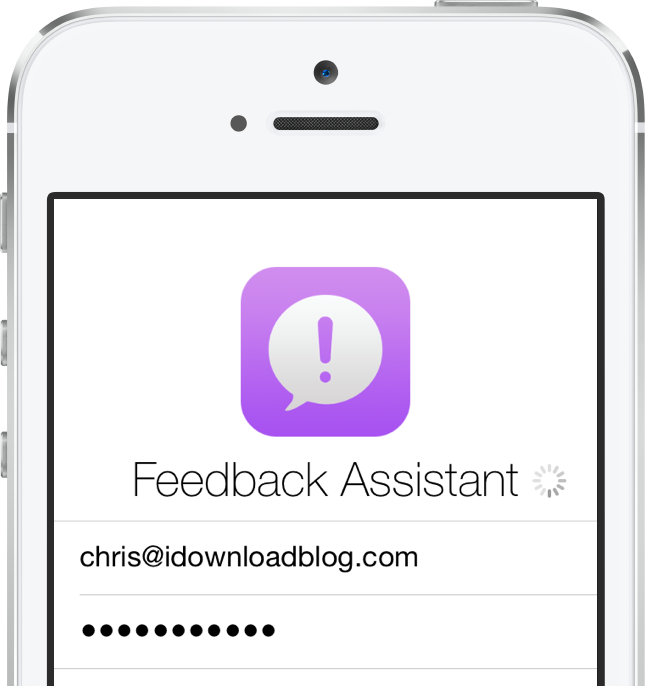 Feedback Assistant—To report bugs discovered in public betas of Apple’s operating system, you’ll use the built-in Feedback Assistant, available as a standalone app or from the Help menu of any Apple app included in public betas of iOS and OS X.
Apple Bug Reporter—An online, developer-only tool with a web-based interface for submitting detailed crash and bug reports to Apple, organizing and tracking submissions and more. Apple Bug Reporter requires an Apple ID tied to your Apple Developer Program membership. Let’s explore these tools in more detail. 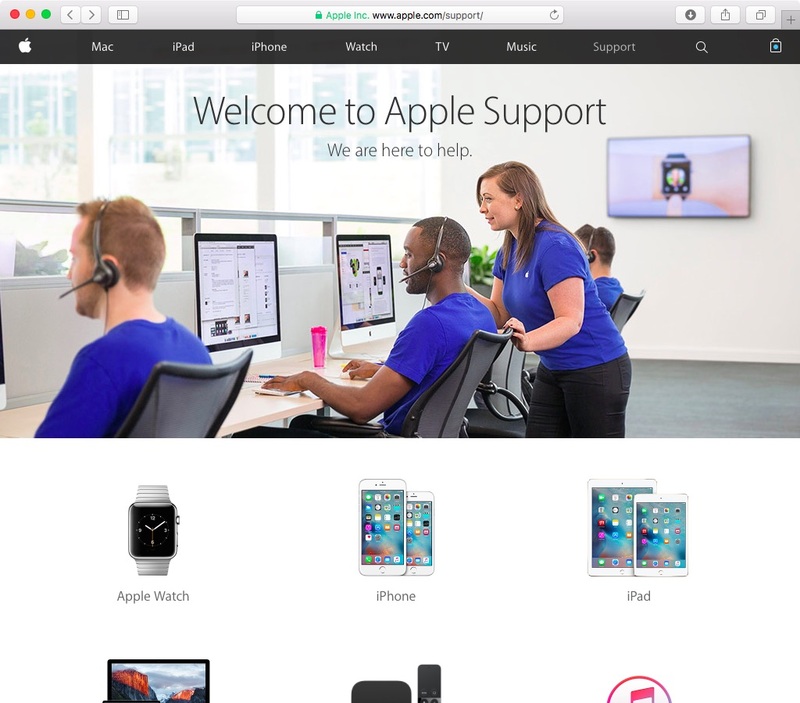 As a general purpose resource, the official Apple Support webpage offers links to helpful per-product resources, including getting support by phone, chat or email using information found on the Apple Support contact webpage, where you can also set up a repair or make a Genius Bar appointment. 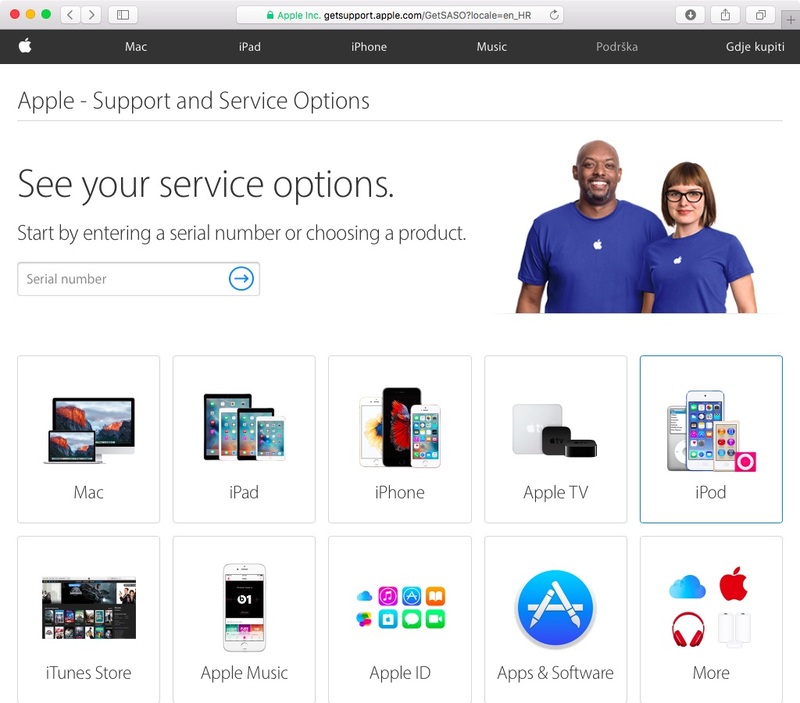 Just click the Get Started button and then enter your product’s serial number, or choose a product from the list, and Apple will connect you to one of its specialists. It’s also a good idea to check your device’s warranty status using Apple’s web tool to see if you’re eligible for service and support coverage. As you may have guessed by now, this option is focused on live support and isn’t particularly useful for submitting bug reports. On the other hand, discussing a problem with an Apple specialist will help isolate the issue so that you can better understand what’s causing it. Armed with that knowledge, you can then send Apple a detailed bug report, if you like. 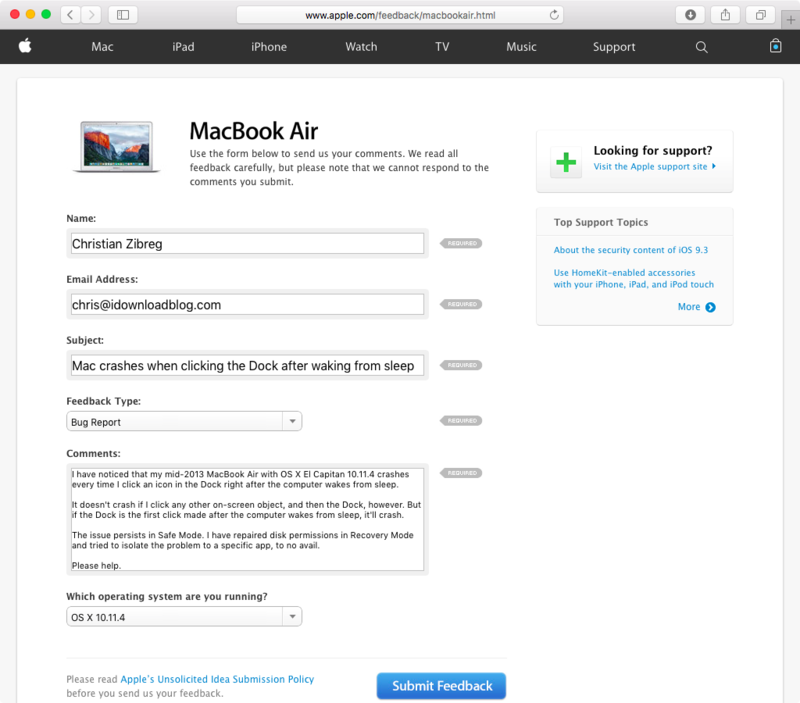 The Apple Feedback webpage is the preferred venue for non-developers to file bug reports though it doesn’t support attaching accompanying material like screenshots and crash logs. Begin by selecting a product you want to file a bug report or send feedback for. 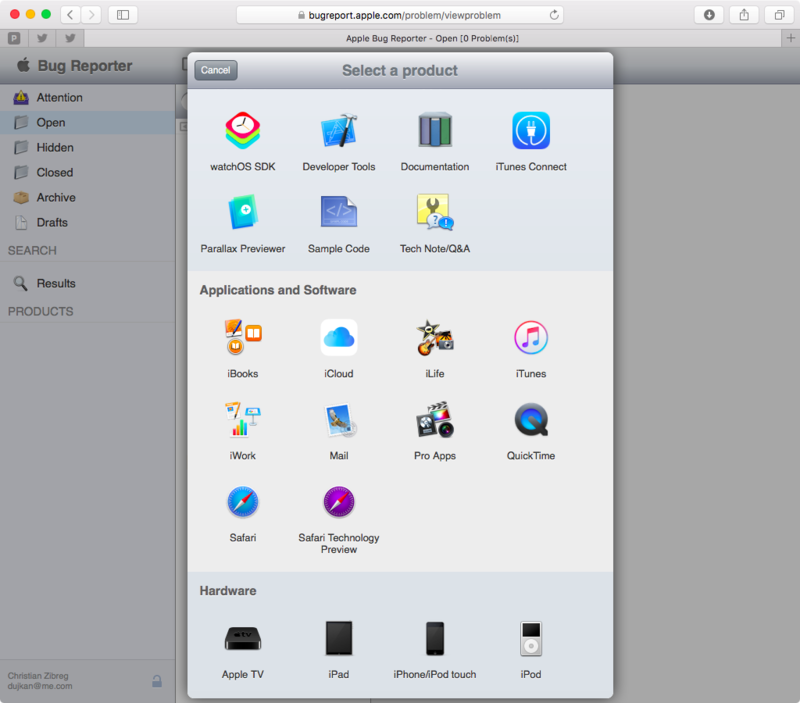 The webpage breaks down various Mac, iPhone, iPad, iPod and Apple Watch devices by model, and you can also select among Apple’s first-party iOS and OS X apps and services like iCloud, Apple Music and Apple Pay. After selecting your product, you’ll be taken to an online form for sending feedback, comments and bug reports. Type your full name and an email address so Apple can contact you if need be, and provide a short description of the issue in the Subject field. Now click Feedback Type pop-up menu and choose Bug Report in the pop-up menu to class your message as a bug report. 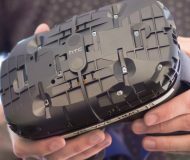 Type a detailed description of the issue in the Comments box along with the precise steps that must be taken to reproduce the bug. Next, tell Apple which operating system you’re using in a pop-up menu at the bottom of the form, and then click Submit Feedback to send your bug report. Free membership in the Apple Beta Software Program gives you access to public betas of iOS and OS X. 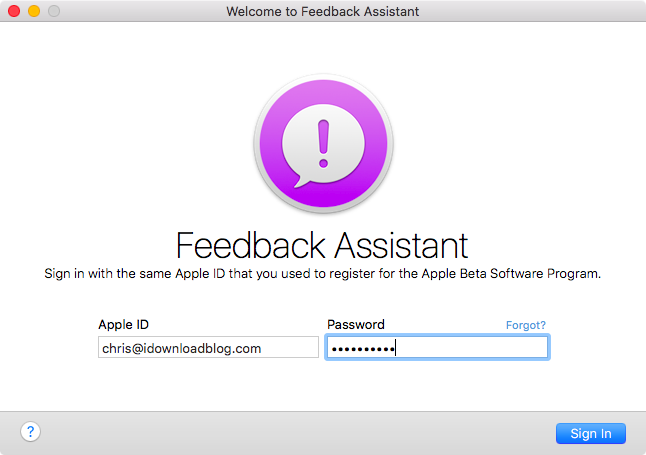 Unlike developer-only builds which are only available to members of the Apple Developer Program, public builds of Apple’s operating system betas come with a built-in Feedback Assistant app. Feedback Assistant is the best way to send bug reports directly to Apple because the app automatically collects all relevant system information and crash logs so you don’t have to. I wish Apple included this app in stable releases of iOS and OS X. On your Mac running a public OS X beta, Feedback Assistant appears right in the Dock. 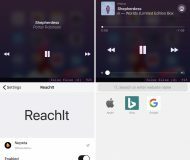 On your iPhone, iPod touch or iPad with a public beta of iOS, the app can be found on the second page of the Home screen. 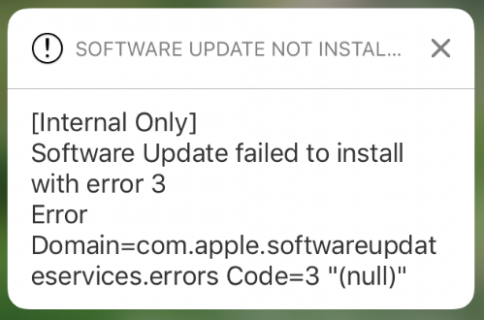 You will also need to provide a detailed explanation of the problem, tell Apple about a software build of iOS or OS X that you’re running, select whether or not you saw this problem before you started using that OS version, how often the problem occurs and if it prevents you from using the OS. Other appropriate fields may appear on the form depending on an app or specific iOS/OS X software section you previously selected. As evidenced by the screenshots below, the process of sending bug reports to Apple is virtually the same in Feedback Assistant for iPhone, iPod touch and iPad. Privacy-minded users should know that Feedback Assistant gathers iOS/OS X device logs which may contain your name, device identifier, network connection, calendar data, email correspondence, web sites you visited, how the app crashed, performance statistics, the approximate location of your device and other identifiable personal information that could be used maliciously if fallen in wrong hands. 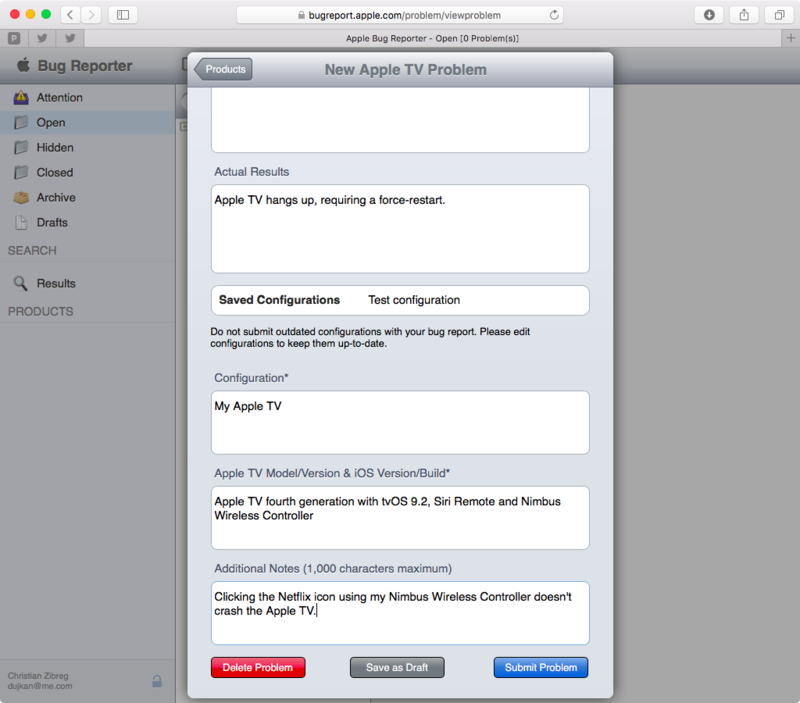 Apple Bug Reporter is a web-based tool that can be used on both OS X and iOS. 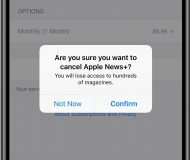 It requires you to log in with an Apple ID tied to your developer account so you must be a member of the Apple Developer Program in order to use Apple Bug Reporter. 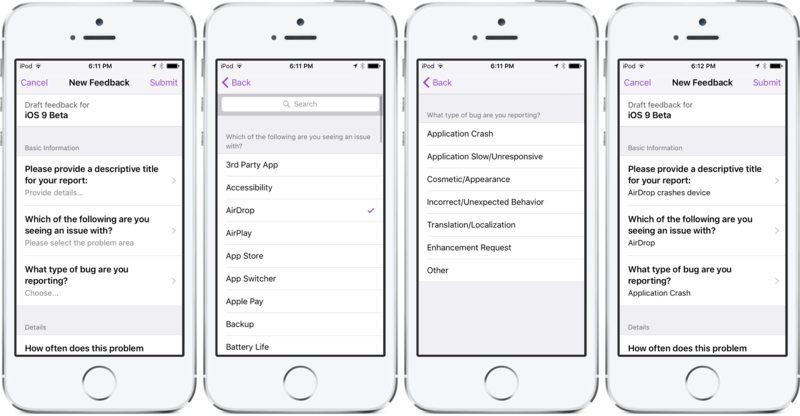 Offering the most exhaustive options for sending and tracking the status of your feedback, filing bug reports and requesting enhancements to APIs and developer tools, Apple Bug Reporter also lets you attach screenshots and crash logs for Apple to investigate. 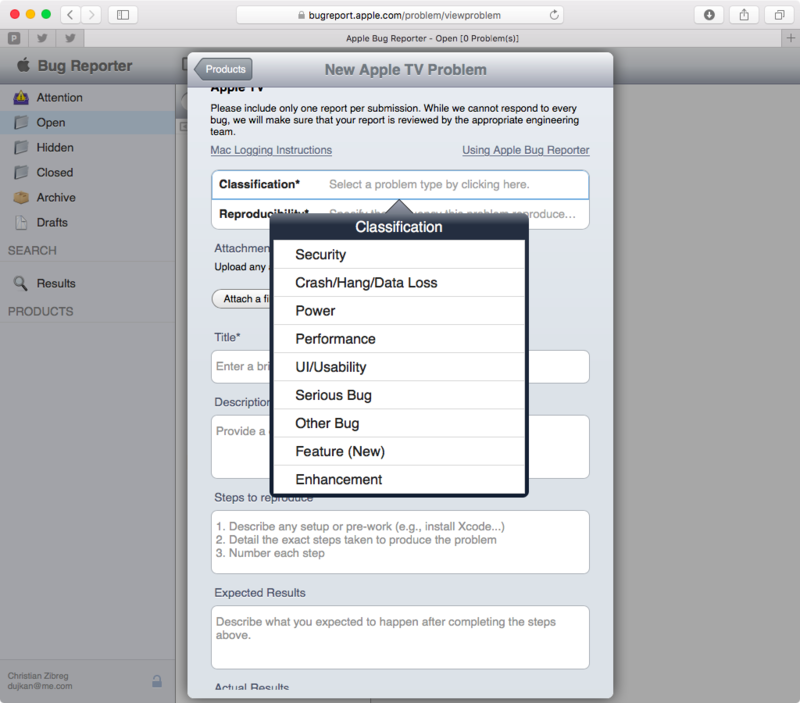 After signing in with your Apple ID, Apple Bug Reporter displays options for submitting and managing bug reports and lets you manage supporting materials like screenshots and log files. You can track your submissions, browse your open and closed problems, use the search field to quickly find a specific case and more. Bug reports that require your attention will appear in the Attention folder. Those reported issues either need more information to investigate or Apple may have information to relay to you. Bug reports inside the Attention folder can be updated by you, prompting Apple to review them. Once they’ve been dealt with, they will no longer appear in the Attention folder. To file a bug report, click the New icon at the top and choose a product you’re having issues with. 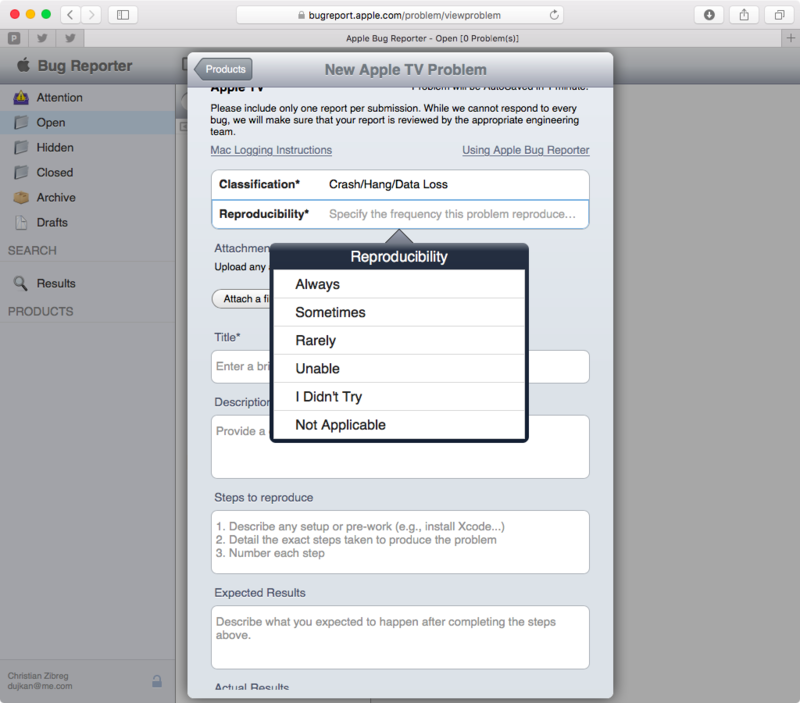 You can report problems for one of Apple’s software environments used for development (Xcode, iTunes Connect, iOS SDK and so forth), end-user applications and services, hardware products like the iMac, MacBook Air, iPhone and more, or click a product that doesn’t fit any existing category under the Other heading. 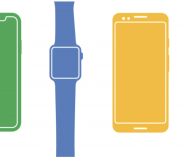 Keep in mind that the fields you see vary from one product, app or service to another. On the next screen, click inside the Classification field to open a menu with pre-populated problem types that pertain to your selected device, app or service. Next, click inside the Reproducibility field to select a description which best specifies the frequency this problem produces: Always, Sometimes, Rarely, Unable, I Didn’t Try or Not Applicable. Click the Attach a File button to attach additional materials like screenshots, diagnostic information and crash logs, compressed into a ZIP archive. In the Title field, provide a brief description that unambiguously expresses the problem you’re having. Describe the problem in the Description field. Provide the steps that reproduce this issue in the Steps To Reproduce field. In the Expected Results field, describe what you expected to happen after completing the steps above. In the Actual Results field, say what actually happened after completing the steps above. In the Configuration field, describe your hardware and software configuration. 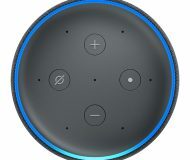 If you frequently report bugs from this device, save its configuration for future use by clicking in the Saved Configuration field, and then click the plus button. Now provide any additional information in the Additional Notes field at the bottom of the online form. 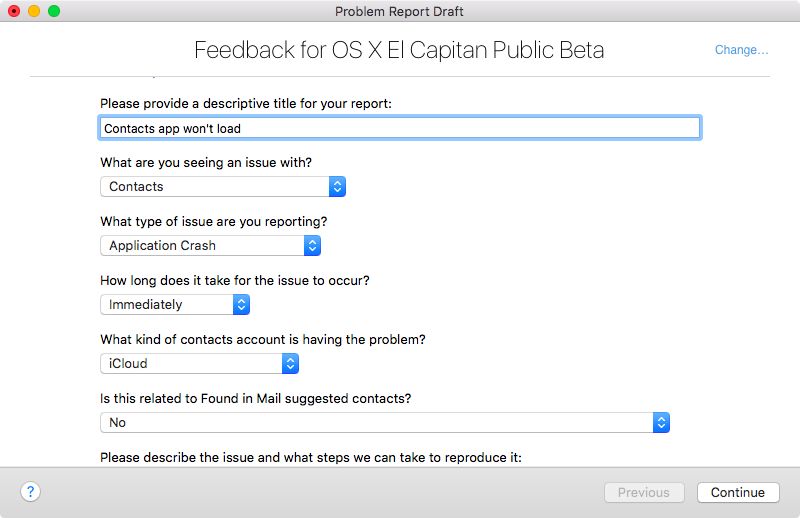 You can now send your report to Apple by clicking the Submit Problem button. 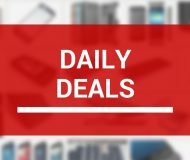 Click Save As Draft to work on this later or Delete Problem to start over. 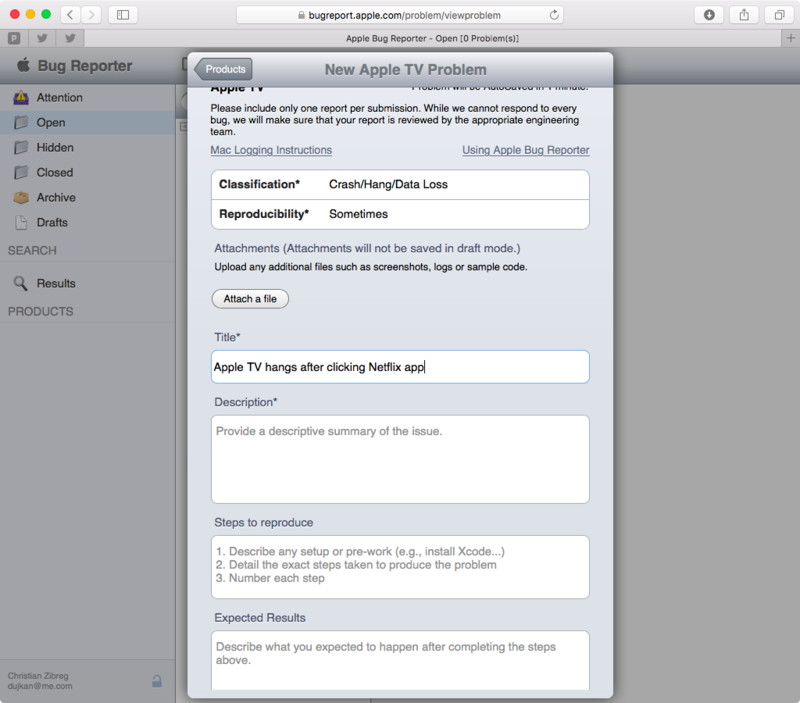 Detailed instructions on sending feedback and submitting bug reports using Apple Bug Reporter can be found on Apple’s website. What to include in a bug report? 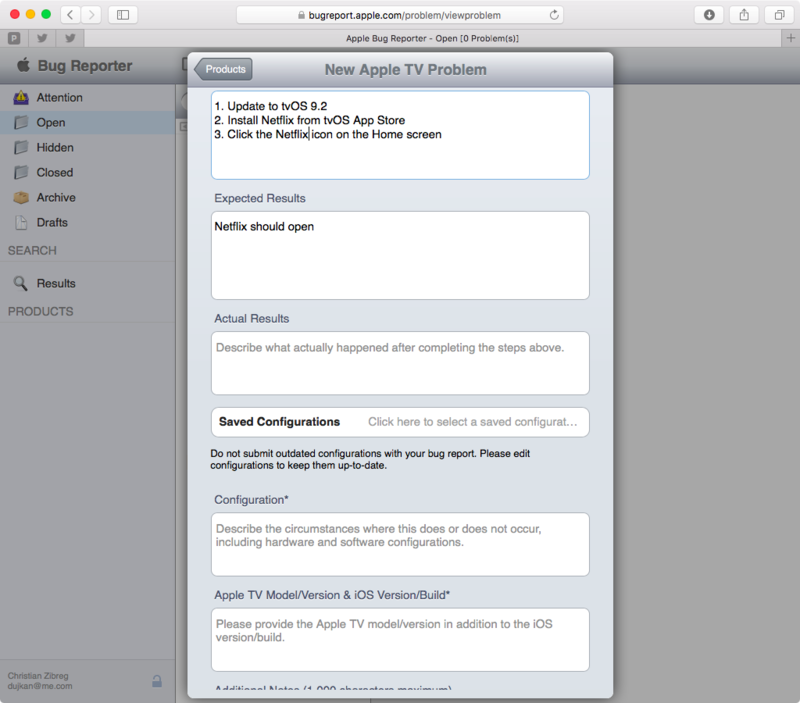 If you file your bug report using the Apple Support or Apple Feedback webpage, adding basic information to your issue report should be enough, such as the product type you’re trying to troubleshoot, version number, OS or app version and so forth. 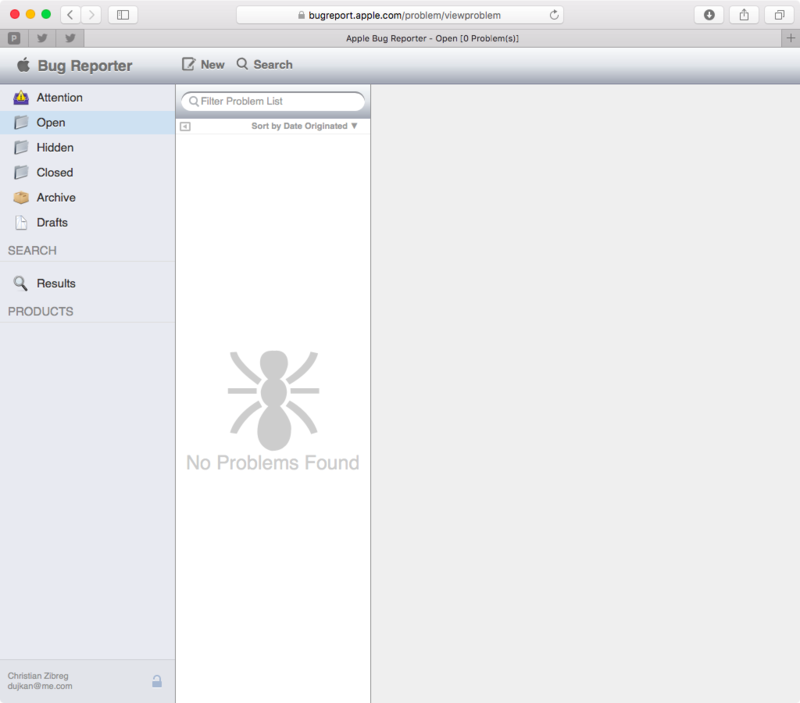 Bug reporting in Apple Bug Reporter and Feedback Assistant comes with the benefit of being able to attach screenshots and any necessary profiles and logs to help expedite Apple’s investigation process. 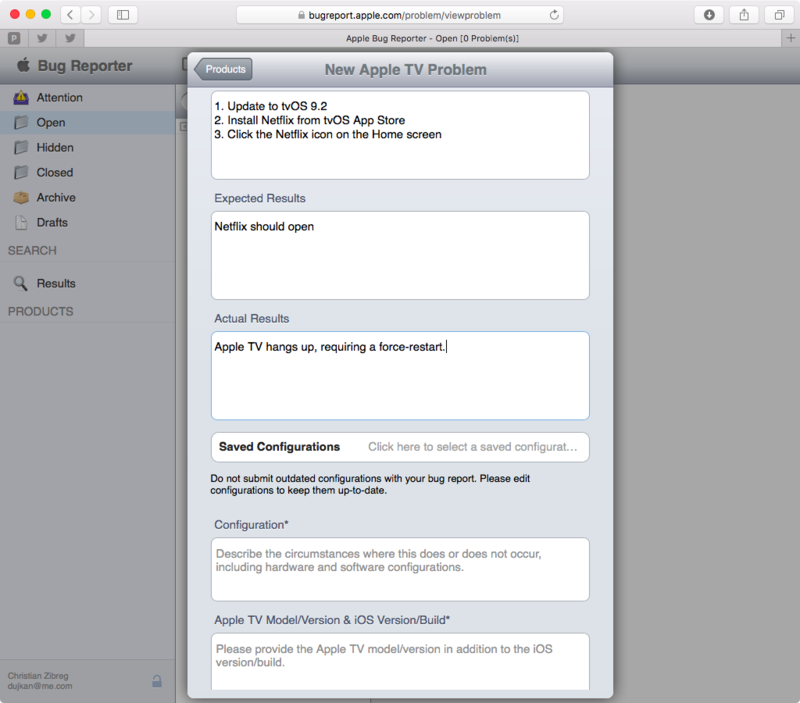 While you may send bug reports from an iOS device with Apple Bug Reporter, you should submit them from your Mac so that you can attach these helpful files. 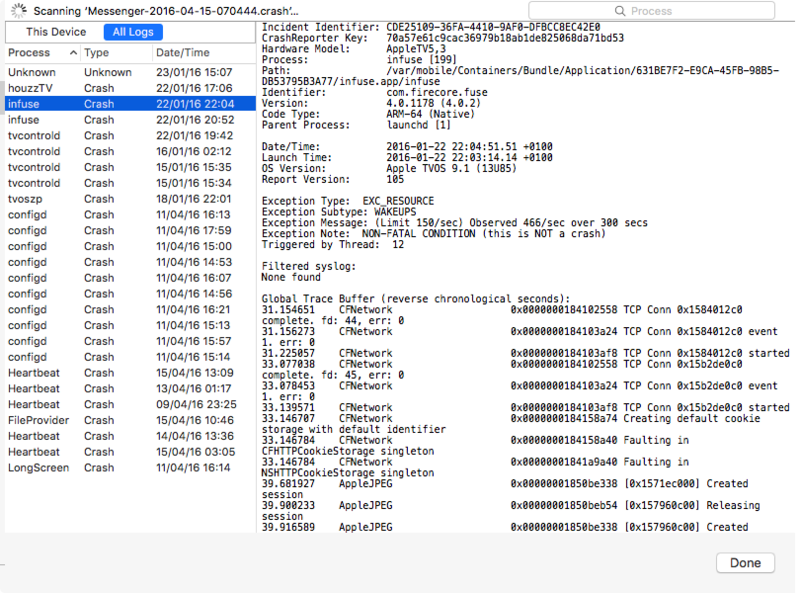 With Feedback Assistant, these logs and diagnostic files are automatically collected on iOS and OS X.
Capturing a snapshot of your Mac’s basic information and performance right after the bug manifests itself allows Apple to try and reproduce your issue to understand what’s causing it. This is known as a sysdiagnose and includes information like apps that were running at the time of the bug and more. To grab a sysdiagnose on your Mac, simply press simultaneously the Shift (⇧) – Control (⌃) – Option (⌥) – Command (⌘) – Period (.) combination. The screen will flash as if you were taking a screenshot. After anywhere between a few seconds to up to a few minutes, a new Finder window will open with the most recent sysdiagnose selected in the window. You’d typically grab a sysdiagnose either while a problem is occurring or immediately after a problem occurs for the best results. 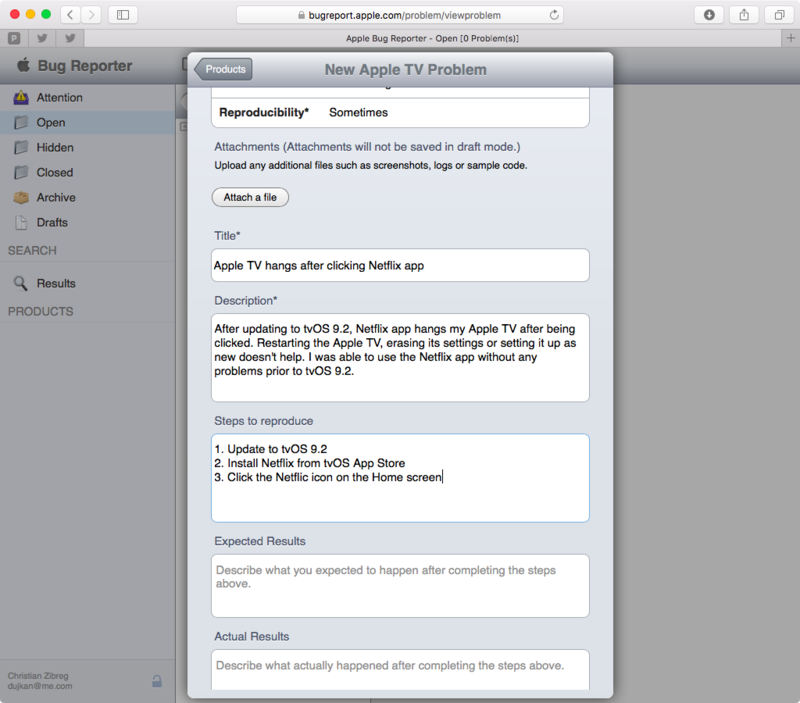 You can attach your sysdiagnose to your bug report in Apple Bug Reporter. If you will be sending folders to Apple with multiple sysdiagnose and crash logs, compress it before sending: right-click or Control-click on the folder in the Finder and choose Compress from the menu that appears. 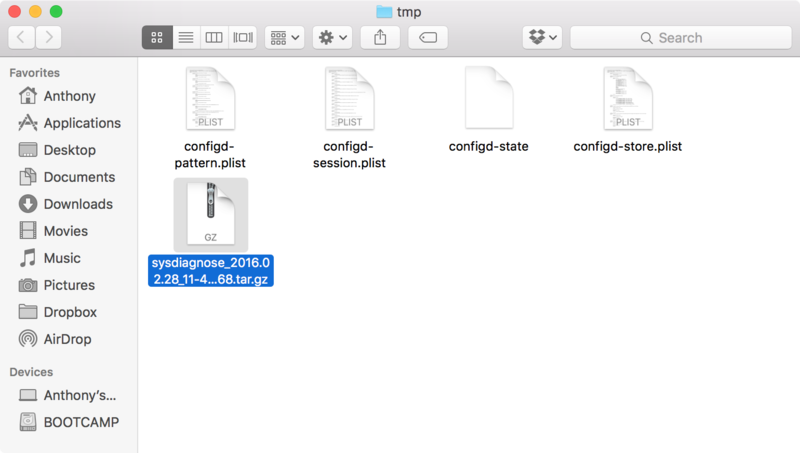 To learn more about grabbing snapshots of your Mac’s system diagnostic files using OS X’s built-in sysdiagnose feature, check out my colleague Anthony’s informative post. When an app crashes on your Mac, it creates a crash log on your computer. You can browse these log files in the Finder: hold down the Option key while clicking the Finder’s Go menu, and select Library. 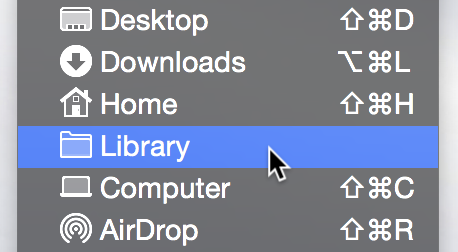 A new Finder window will open, showing you the contents of your system’s Library folder. Navigate to the Logs/DiagnosticReports/ sub-folder to find your crash files. Drag a desired file to the desktop or a folder in the Finder, or add it to the previously created compressed archive of other supporting materials, like screenshots. NOTE: “~” refers to your user account’s home folder. Make sure you don’t accidentally delete other files inside these system folders or your Mac might stop functioning and might even refuse to start up properly. 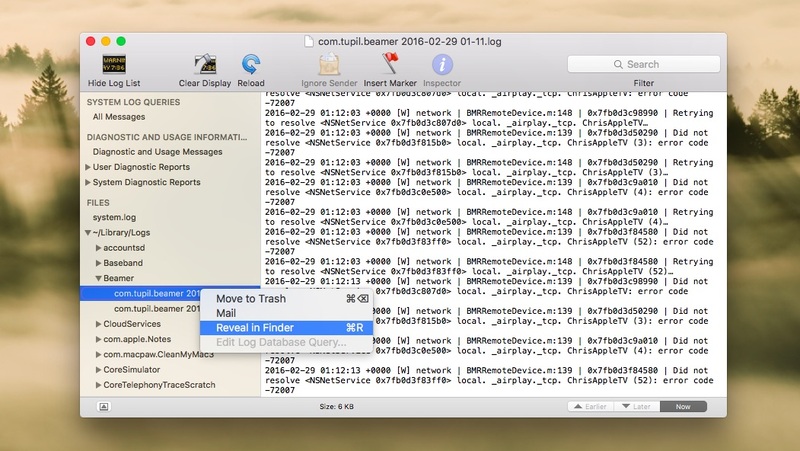 I’d recommend using OS X’s built-in Console app in the Application → Utilities folder to collect your crash logs. This app makes it easy to browse and export log files on your computer and it neatly arranges crash logs depending on if a system level process has crashed or a user level process. 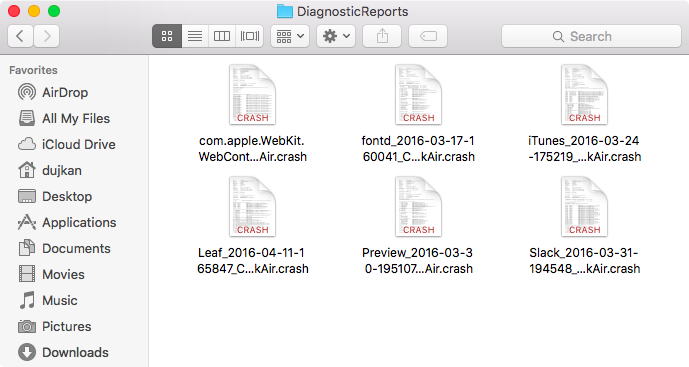 To locate a crash file in the Finder, right-click an entry in Console’s sidebar and then choose Reveal In Finder (or Mail to email the crash report). 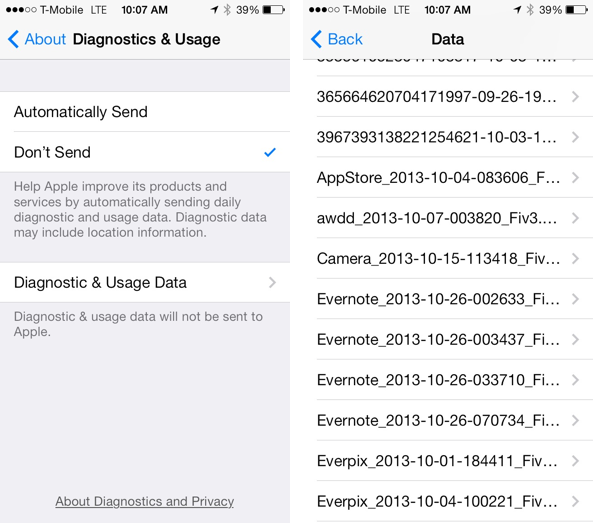 To find your iOS device’s diagnostic data, venture to Settings → Privacy → Diagnostics & Usage → Diagnostic & Usage Data and tap an entry to read it. You can then select all text in the diagnostic report and copy it to the system clipboard to paste into email messages or send to other apps. When you sync your iOS device with iTunes on the Mac, these diagnostic reports are downloaded to your computer so they’re easier to browse manually, and then they’re deleted from your iOS device. For those wondering: after connecting an iOS device to iTunes and performing a sync, diagnostic logs will also show up in the Console utility on your Mac where they can be safely browser and examined. 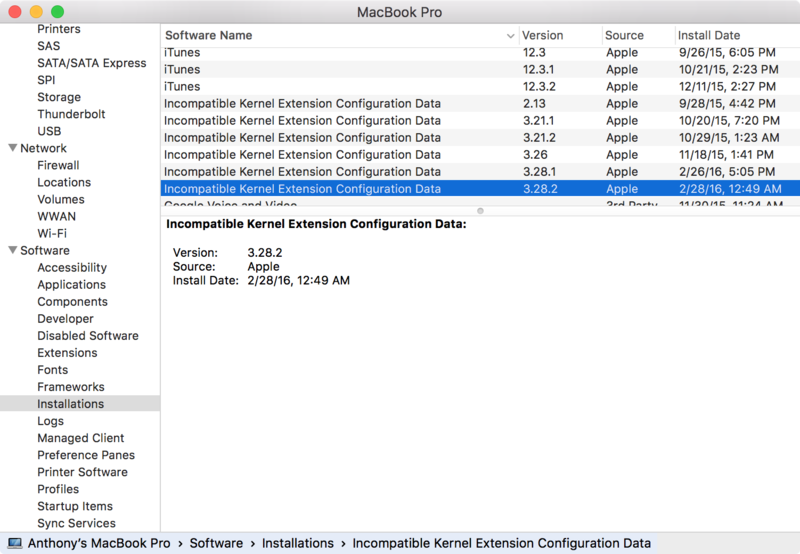 To download and browse diagnostic logs from an Apple Watch or Apple TV to your Mac, I recommend Apple’s free Xcode app, which includes some interesting functions. For starters, Xcode lets you examine crash logs stored on any device that’s connected to your Mac with a cable. After connecting an iOS device to your Mac with a USB cable, or an Apple TV using a USB-C-to-USB cable (sold separately), select Window → Devices in Xcode, or press Shift (⇧) – Command (⌘) – 2, and then choose your connected device in the Devices window. 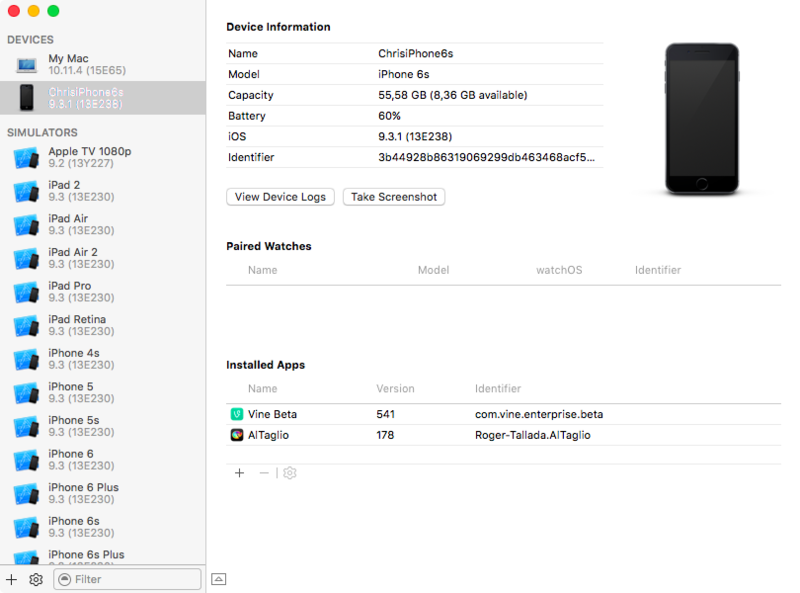 Now click the View Device Logs button under the Device Information section on the right hand panel to bring up sheet displaying the crash logs downloaded from the connected device. Use the lefthand column to find a specific app under the Process column or select the crash you want to take a closer look at. To save the crash log as a file on your computer, right-click the entry on the left column and choose Export Log. 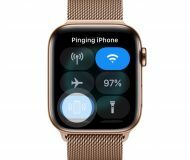 Tip: For watchOS app logs, you must connect an iPhone paired to an Apple Watch. 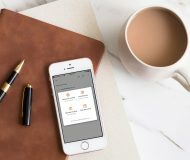 Detailed information on managing diagnostic and usage data on your iPhone, iPod touch or iPad can be found in our step-by-step tutorial. 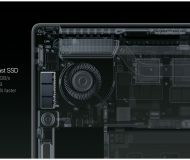 OS X’s built-in System Information app analyzes your Mac’s hardware and software so that you can see precisely which Mac model you have, the version of OS X you’re using, what devices you have connected and more. Apple, too, needs this data to understand the nature of your problem. To capture detailed information about your Mac as a file, click About This Mac in the Apple menu and then click the System Report button on the Overview tab. A new window opens, showing you different pieces of information pertaining to your Mac. To create a copy of this report to attach to your bug report, choose File → Save and then name and save your file to the desktop or in a folder on your Mac. Again, you may want to add this file to your ZIP archive containing other materials like screenshots, crash logs, diagnostic information and more. 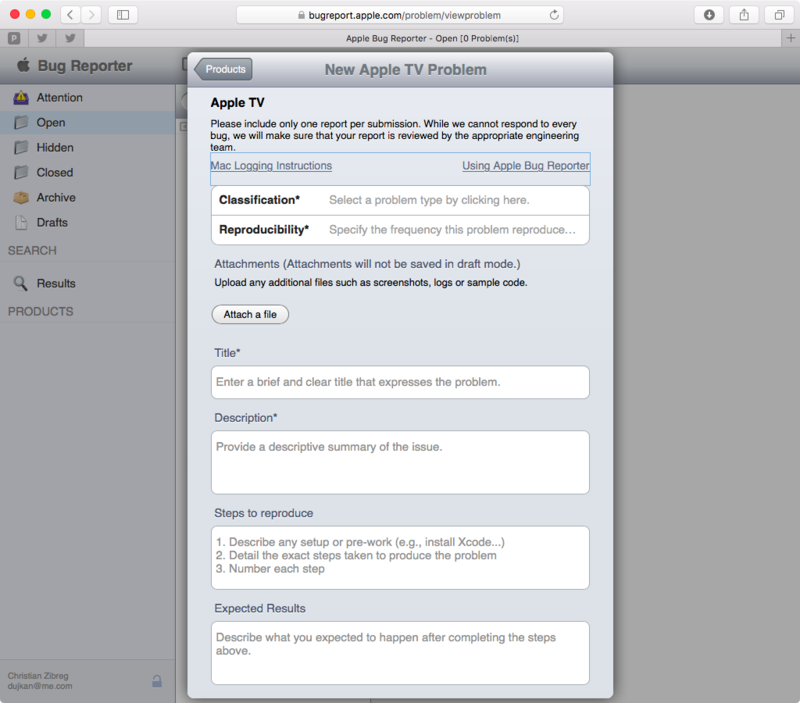 Apple’s website offers comprehensive resources on crash logs, reproducible test cases and other information they need to investigate and diagnose your reported issues. Will Apple respond to my feedback? That is, “We read all feedback carefully, but please note that we cannot respond to the comments you submit,” as per Apple. 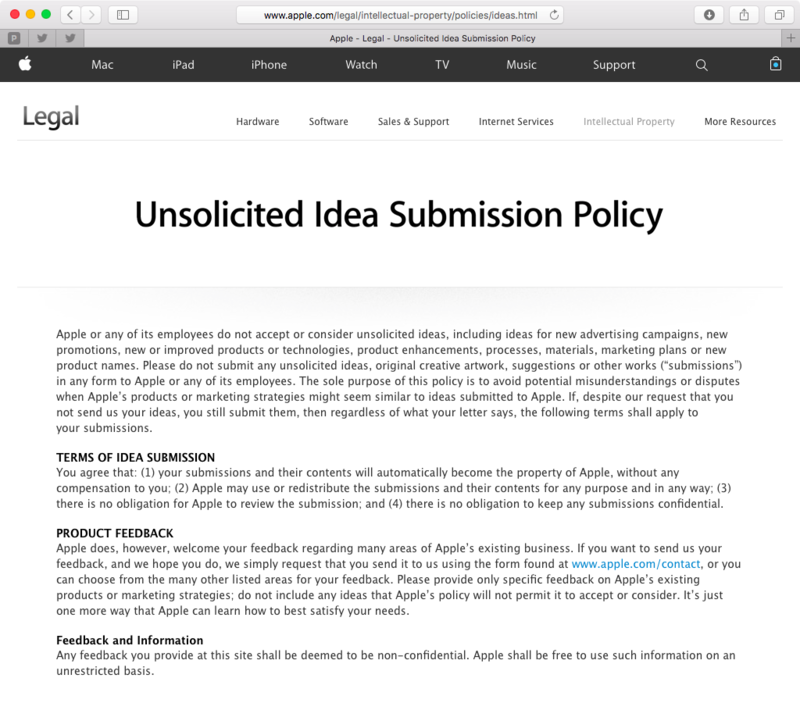 Although Apple cannot respond to you personally, you shall receive an automated email message to the provided email address informing you that your submission has been received and will be reviewed by the support team. And if Apple determines that it needs to follow up with you on the problem you’re experiencing, one of their support people might in fact contact you directly. On a related note, before you submit feature requests and other product improvement submission know that Apple can steal ideas from you. Feel free to check out the discussion forums on the Apple Support Communities webpage to discuss with others problems you’re plagued with and any issues with your Apple devices and software to verify that their experiences are the same as yours. 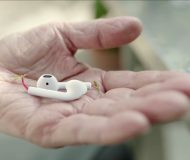 You can also follow Apple Support on Twitter helpful information and to get in touch with Apple specialists who will help you with any question you may have. Said places are useful for collecting as much information about your specific problem as possible before you take other troubleshooting steps or report a bug to Apple. 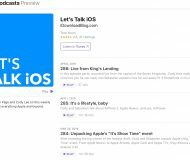 Last but not least, iDownloadBlog’s in-depth article about troubleshooting common issues on the Mac, as well as our archive of troubleshooting how-tos, are great starting points if you’re thinking about submitting feedback or bug reports to Apple. Don’t like something on OS X El Capitan? 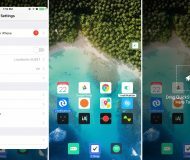 A particular bug in iOS has been ticking you off for quite some time now? 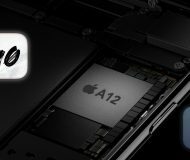 Apple has provided us the tools to let them know about the issues we’re having in an actionable format they can mass-collect and analyze in order to prioritize their bug-squashing processes. So, instead of complaining in frustration about the Apple software that doesn’t “just work”, submit your personal feedback to Cupertino, California and make them aware of the bugs. The more users report the same bug, the more likely that issue is to be escalated to the higher-ups. 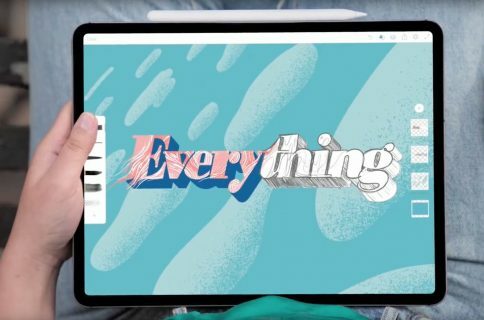 And by highlighting the bugs and letting Apple know what you think of their software, you boys and girls out there are all taking part in shaping Apple’s products. Got stuck? We’re here to help! Not sure how to do something on your Apple device? 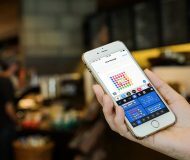 Let us know at help@iDownloadBlog.com and our future tutorials might cover your specific problem and hopefully provide a solution.